Washington And Lee University, an institution of learning at Lexington, Va. Its germ was the Augusta academy, a mathematical and classical school established by Robert Alexander near the site of Greenville in Augusta co. In 1776 its name was changed to Liberty Hall. In 1785 the institution was removed to near Lexington, and in 1803 to its present site within the limits of the town. It was chartered in 1782. In 1796 George Washington gave to it the 100 shares of stock in the James River canal company which the legislature had granted to him, and the name of the institution was changed to Washington college. In consideration of retiring this stock the legislature agreed to pay to the college 6 per cent, on $50,000 annually for ever. In 1803 the Cincinnati society appropriated their funds, amounting to nearly $25,000, to Washington college; and in honor of this endowment the " Cincinnati professorship " was founded. The "Robinson professorship" was created by an endowment of $40,000 realized from a bequest made in 1826 by John Robinson, one of the trustees. During the civil war its sessions were suspended. 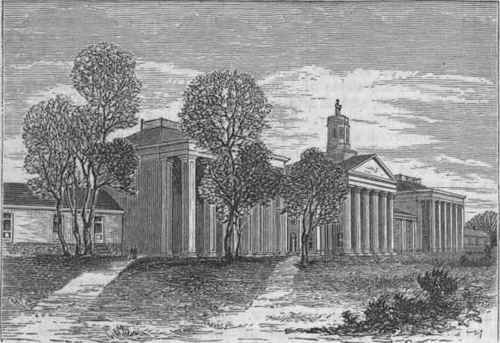 In June, 1864, when Lexington was occupied by Gen. David Hunter, much damage was done to the institution; its chemical and philosophical apparatus was destroyed and its libraries were greatly injured. After the war liberal contributions were received from various parts of the country. Soon after the death of Gen. R. E. Lee in 1870 the name was changed to its present form. The presidents of the college, with the dates when they entered upon their duties, have been as follows: the Rev. William Graham, 1782; Samuel L. Campbell, M. D., 1796; George A. Baxter, D. D., 1799; Louis Marshall, M. D., 1830; Henry Vethake, LL. D., 1834; Henry Ruffner, D. D., LL. D., 1836; George Junkin, D. D., 1848 to 1860; Gen. Robert E. Lee, 1865; Gen. G. W. Custis Lee, 1871. - A distinguishing feature of the system of instruction is the arrangement of courses of study into distinct elective schools or departments. The student may select such schools as he wishes, not fewer than three in the academic department; but in each there is a prescribed course of studies, from one to three years, which he is required to pursue. The several schools are adapted to certain courses of study, to each of which is attached a corresponding degree. Instruction is by lectures and recitations, of which 18 must be attended weekly by each student. The government of the university is vested in a board of trustees, and the immediate administration of its affairs in the president and faculty. The schools are as follows: 1, Latin; 2, Greek; 3, modern languages; 4, English language and philology; 5, moral philosophy; C, history and literature; 7, mathematics; 8, applied mathematics (civil and military engineering and astronomy); 9, natural philosophy; 10, chemistry, mineralogy, and geology; 11, applied chemistry and mining; 12, civil and mining engineering; 13, law and equity. Courses of instruction are provided in July and August, chiefly for teachers and students desiring to enter advanced classes at the next regular session. The academic degrees conferred are those of bachelor of philosophy, of science, and of arts, master of arts, and doctor of philosophy. The last named degree is conferred upon any graduate in any one of the baccalaureate degrees of the university who, for at least two years after graduation, has pursued at the university or elsewhere a special course of study in any one of the following: 1, the Latin and Greek languages; 2, the French, German, and English languages; 3, mental and moral philosophy, history, and political economy; 4, mathematics and its applications; 5, the natural sciences. The professional degrees are those of civil engineer, mining engineer, and bachelor of law. Degrees are conferred after written examination, and none are conferred in course. Special privileges in the way of free tuition or a reduction of fees are extended by the board of trustees to students ranking first in certain high schools and academies, to young men intending to become practical printers, journalists, or teachers, to indigent students, to candidates for the ministry, and to sons of ministers. The faculty may admit as post-graduates to the academic departments of the university, free of charge for tuition, graduates of any college or university. These privileges do not apply to students taking professional courses. The university has a library of 12,000 volumes, full and complete mineralogical, geological, and zoological cabinets, and valuable philosophical and chemical apparatus. Since its reorganization in 1865, there has been an average annual attendance of about 300 students, and 20 instructors.